The first week of April was Semana Santa (Holy Week). Thursday and Friday were holidays and the Monday of the same week was also a holiday in remembrance of the Malvinas war (see previous post). So we opted to take the whole week off of school. We rented a car for a week and drove a total of about 2000 km, visiting the provinces of Córdoba, La Rioja, and San Juan. A nice mix of camping, hiking, and swimming, as well a visit to the colonial city of Córdoba. Images, in order, show the following places: Mina Clavero, Parque Nacional Quebrada del Condorito, Alta Gracia, Córdoba city, Parque Nacional Talampaya, Parque Nacional Ischigualasto, and the shrine to la Difunta Correa. Although it has taken time and several governments, Argentina has made important steps toward recognizing the atrocities of the past. The National Day of Memory for Truth and Justice was commemorated throughout the week with lectures, theater festivals, film screenings, and concerts, all devoted to the theme of human rights. We are also approaching the April 2nd anniversary of the 1982 Falklands War (Guerra de las Malvinas), which was a last-ditch effort by the ruling Argentine junta to shore up public support for the regime. The idea was to rest from Britain this small group of islands that Argentina believed are rightfully theirs. This war, intended as a way to unite the country behind a patriotic cause, was a dismal failure for Argentina and resulted in senseless deaths of more than 600 young Argentine soldiers. The war’s end marked the return to civilian government in Argentina. The Malvinas islands are back in the public eye because the Argentina government has spoken out against British oil exploration in the area. Popular sovereignty and neo-colonialism are the cries from the Argentines, while the Brits speak of the rights of the almost 3,000 UK citizens living on the islands. Roger Waters, recently in Chile and Argentina with his Wall tour, told journalists he believed the islands should belong to Argentina. That got a lot of press. We attended a public concert, Canto para la Memoria, which featured Argentine singer-songwriters, and Uruguayan songwriter, Daniel Vigiletti, and Chilean folk group, Illapu. It is interesting to note that the main acts were brought from neighboring countries, which also experienced military dictatorships. Argentina does not seem to have prominent national musical artists who have carried on the tradition of popular song known as ‘nueva canción.’ Viglietti and Illapu are artists who experienced the eras of repression in their own countries, but they both expressly stated that their respective countries have yet to take similar steps, as Argentina, toward acknowledging the past. Okay, who wears rose-colored glasses these days? Well, if you don’t you should. They enhance contrast and make the world seem, yes, brighter. My sunglass lenses are more orange than rose, but the effect is much the same. What’s my point? It’s more of a commentary or, perhaps, a confession. Hiking in the high-altitude, Andean landscapes here in Mendoza, I often wear my orange lenses. With them the colors of the rocks and soils, seem to just jump out, as if to say, “this is no ordinary landscape or ordinary experience.” I take a lot of pictures, anxious to share the experience of these landscapes. What I forget is that what seemed truly extraordinary at the time, turns out upon later examination, sans glasses, to be not quite what it was in the moment. Not always, however. This brings me to the topic of this post: Aconcagua Provincial Park (ah-con-cah-gwa). Yes, home to the hemisphere’s highest peak, a feature that attracts literally thousands of foreign visitors to Mendoza between the months of December and March, when the summer climbing season makes the peak most accessible. A guided and fully-outfitted summit attempt requires about 16 days and $4,000 USD, neither of which are within my reach. When we first got here, I was asked on several occasions if I would try to climb Aconcagua. My response has always been that I would rather spend the time and money seeing more and doing more. Major summit attempts seem so singularly focussed, to the point of being stressful. However, Aconcagua Provincial Park offers some excellent trekking and that is what I went for. A three-day hiking permit (still not cheap at about $80 USD) allows one to hike to a spot known as Plaza Francia, at the base of the peak’s famed southern wall (la pared sur), an awesome 3000 meter (9,800 ft.) rise of stone and ice. In the rotating 3D graphic, look for the prominent valley leading up to the steep southern wall. This is the hike to Plaza Francia. The rock in these mountains are of two origins. At lower levels, sedimentary rock prevails, layers of which where deposited at a time when warm, shallow oceans covered the land. This rock accounts for the layered striping in green, white, red, and black. Higher up, the rock is entirely volcanic in origin and derives from lava flows that occurred during the periods of uplifting that were responsible for the creation of the Andes. The park entrance is already high-up at 2,700 meters (8,800 ft.). Confluencia, where I camped the night is at 3,400 meters (11,150 ft.). And Plaza Francia is at 4,200 meters (13,780 ft.). All of this requires some acclimatizing. Upon reaching my camp spot at Confluencia, I immediately began the process of heating water for bouillon and soup. I then took an aspirin, and napped for two hours. I was told by the park guard to come see the camp doctor at 7 pm. He used a pulse oxymeter (amazing device!) to assess the level of oxygen in my blood, which was normal, and to advise me on the matter of hydration. “At altitude, drink 3-4 liters a days when not active, and 4-5 liters when active.” I did my best to fulfill this order. The result: I felt good, but had to go pee-pee A LOT! Because the climbing season has wrapped up, where normally there would be between 100-300 people at Confluencia, there was just me and one other tent. I arrived with partly cloudy skies, experienced a brief snow-shower in the afternoon, a mild earthquake, and then a splendid clear night sky, including a setting crescent moon alongside, was it Jupiter or Venus?, and later there was Pleiades, Orion and the Southern Cross. I slept with the tent wide open so I could see the sky, which also allowed for quick exits when hydration relief came calling. I had seen pictures of the park and quite honestly, without my rose-colored glasses, it looked like a lot of dull, pale, desert mountain scape. While the aesthetic of the landscape may take time to appreciate, the impact of the sheer scale is immediate. But once one settles into the environment, the colors do indeed begin to reveal themselves (glasses recommended!). In addition, over the course about a day of hiking one also experiences the landscape under different light conditions. And hiking up a valley reveals one aspect, while hiking down, another. Whether you can ever get to Aconcagua, get outside, wherever you are. And don’t forget your rose-colored glasses, proverbial or real. We jokingly comment that our apartment at times resembles an international hostel. Two nights ago we had 6 visitors staying with us, three in the guest room and three sleeping on the living room floor! This all started when I registered us as a host for bike travelers on the warmshowers.com website (a social network where bikers can contact potential hosts with whom to stay during their travels). In addition, we have given open invitations to many of the travelers we met while biking in the south. In light of the hospitality and generosity we experienced on our own bike trip, it seems only natural that we should do the same for other travelers. In November we hosted two brothers from Ecuador who were embarking on a two-year bike journey around South America (biciecuador.com). They had left their country with a total of $23 USD and had managed to make their way working occasionally and living off of the generosity of strangers. 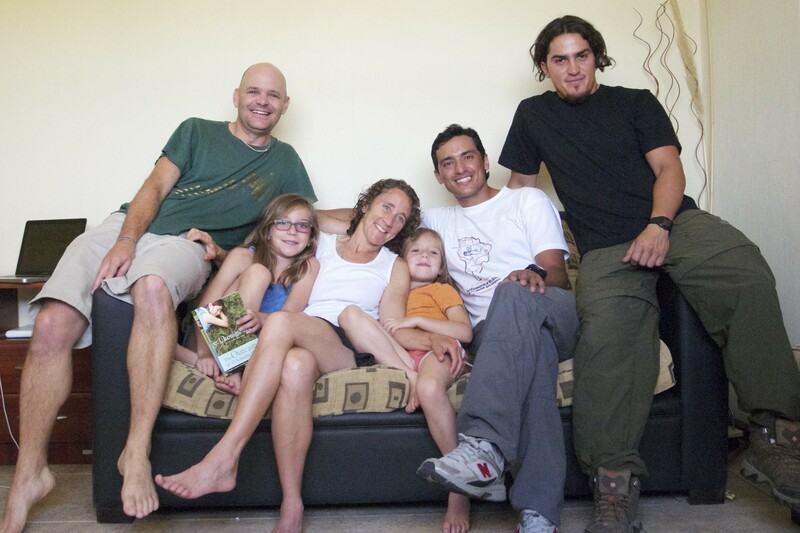 The brothers had stayed with our friends Lojo and Dan in Chile and we welcomed them shortly thereafter here in Mendoza. Let’s just say they could eat! I recently checked their website and it is very clear that traveling in today’s world with next to no money has not proven easy. But these guys seem to be pulling it off. In December, we hosted Laurie and Julien from Belgium. They were riding recumbent bikes from Ecuador to the tip of South America. They stayed a week with us. We recently heard from them, letting us know that they had indeed made it to their destination. Congratulations! Three weeks ago we had a morning visit from Sarah, one of the three women hiking the length of South America (Eat Hike Sleep Hike). Two days ago, Francois (France) (defidaventures.blogspot.com) arrived quietly on little cat’s feet. Jenny had met him in the town of Cholila on our bike trip and offered a place to stay once he arrived in Mendoza. He is the only cyclist we have met who is doing the route south to north. Yesterday, he went to 6 different bike shops looking to replace an axle cone, with no luck! Argentina and foreign imports are like oil and water. Hours after Francois arrived, our doorbell rang. Assuming it was Francois returning from some errands, I buzzed him in. But when the elevator opened, voila, it was not Francois but rather Daniel (Poland) and Katalin (Hungary). They had contacted me a while back via “warmshowers”, but we were never sure of their actual arrival. They are hoping to bike for a year from here up to Mexico. However, they have no bikes, no equipment, and no experience. We all agreed, and time on the road bares this out, enthusiasm is the most important ingredient. Well, Daniel and Katalin certainly have that. Yesterday, they headed back to Santiago to purchase bikes, as the local prices and selection are limited. They left some gear with us and we assume we will see them in the next week or two. While hosting may have its drawbacks (lack of privacy and alone time), the experience of sharing with and learning from others is so valuable. Solana and Frances have learned so much just being around our guests and witnessing it all: the accents, the stories, the road, the passions, the questions, the laughter, the food, etc. And while many back home have looked upon our bike trip as an ambitious adventure, which I guess it was, the number of fellow bike (and non-bike) travelers we have met is a testament to just how many people are out there pushing it, doing something different. It’s a simple concept and very, very practical. My friends at Two Wheel View turned me on to the idea of a simple cordura bike bag as a means of transporting bikes. They provide decent protection and don’t require taking the bike completely apart. You can simply roll them up and travel with them on the bike. They also make great ground cloths, yoga mats, and rain tarps. The second lesson I learned from Two Wheel View is the all around utility of nylon zip ties. I carried 50-100 on the whole trip. They are great for securing the front wheel to the frame when breaking down the bike and they are very adaptable for use in making repairs. I helped repair a Chilean biker’s broken rack with them and I later used them to repair the rear rack on my bike, which had cracked in three places. During the trip I had to pack up the bikes a total of four times for transport, without the bags and zip ties, this would have been a real hassle. If you know a teenager who might want to experience mountain bike touring, check out the programs offered by Two Wheel View. Now that I got your attention with that snappy, academic, post-modern heading, let’s begin. These are some panorama photos I took on my way up to Cerro Hielo Azul, a 2,260 meter peak outside of El Bolsón, Argentina. (This was a side trip I took while we were living on the strawberry farm). This region of the Andes is quite distinct from where we live in Mendoza. Mendoza is home to the high Andes and Aconcagua, the tallest peak in the Western Hemisphere at almost 7000 meters. The higher peaks nearer the city of Mendoza are between 5000- 6000 meters. Here there is little moisture and vegetation and surface water is quite sparse. The glacial ice is found beginning at about 4100 meters. And that kind of altitude requires some acclimatization. However, farther south, the Andes lose elevation. This loss of elevation, coupled with increased distance from the equator, 42 degrees latitude, and greater moisture from the the Pacific west, create conditions under which glacial ice and lakes can be found at under 2300 meters. This altitude is far more accessible and requires no acclimatization. In addition, there is lots of forest to enjoy while hiking. Needless to say I was quite taken with this environment. Caption contest: post a comment with your entry! Photo documentary of my four-day outing to the Cordón de Plata and a summit attempt of Cerro Plata. The podcast provides a visual document of our days climbing: Snow, flowers, scree slopes, ramen, mate, headaches, and acclimatization at 14,000 to 17,000 ft. The springtime flowers were in full bloom and the arid soils of the lower peaks revealed amazing colors. I took numerous photos of this colorful landscape, experimenting with depth of field and framing the figure of my hiking companion within this landscape. The podcast is largely silent. Despite numerous sound recordings from the field and attempts to narrate the slideshow, I couldn’t really come up with an interesting angle. Lacking a more creative and interesting way to add my voice to the mix, I think silence was a safer bet. (That’s right I couldn’t even come up with humor. Truth is, humor’s hard!) The visuals speak for themselves and in some cases I have added some pen strokes to help identify exactly where we were hiking. Unfortunately, the landscape shots suffer a loss of quality somewhere in iMovie or the Quicktime conversion. I find Keynote does a much better job of preserving image quality and most of the previous podcasts were done in Keynote. This podcast uses video and time lapse images, which were easier to edit in iMovie. However, the downside is the loss of image quality. If anyone has advice on this matter, I welcome it. This is the latest of numerous podcasts on the blog. I know they are time-consuming to view and thus get passed over by many. However, I like making them. So there. On March 2, we arrived back in Mendoza from our bike tour after a 20-hour bus ride from San Martin de los Andes, exactly two months to the day since leaving Mendoza on January 2. (Above photo taken in Parque Nacional Los Alerces in Argentina). Flat tires= 0 (zero). Thank you Schwalbe Marathon Tour Plus tires. One-pot meals cooked on our camp stove= +80 (lost count). Roadside pee breaks= countless. Jenny and the girls are experts! Pieces of gum chewed= ask Jenny! Number of words of encouragement left on our blog and on FB= THANK YOU! The blog will be updated now with more regularity as we attempt to chronicle our current activities as well as provide some badly needed documentation of our bike adventure in northern Patagonia. Thanks to all who have followed us on our adventure thus far and to all of those who have subscribed to the blog, many of whom we know and some that we don’t. We hope you keep reading and looking! También un fuerte saludo y agradecimiento a todos Uds. que de una forma u otra nos echó una mano durante nuestro viaje en bicicleta. Sin su ayuda no hubiéramos podido realizar este viaje. La buena voluntad de todos nos ha marcado profundamente y ha sido un tema de continua conversación entre la familia. Nos sentimos humildad frente toda la ayuda y buenos deseos que formaron una parte inolvidable de nuestro viaje. Although we have a rough idea of an itinerary, we are not on a schedule. We don’t have to be anywhere by a given date. Even if we did have a schedule, we would have to abandon it. The road and weather are as unpredictable as the experiences we are having. We never know what awaits us at a given destination, nor on a given day do we always know what that destination will be. After crossing the border from Argentina to Chile, we stayed two nights in Futaleufu, the whitewater capitol of the world. Here we had the good fortune of running into a biking couple from New Zealand who were able to give us a good idea of what lay ahead. Charlie and Veronica were wonderful company and we hope to see them some day in their new home of Vancouver, Canada. It was clear that the road from Futaleufu was NOT something we were going to try to ride. Charlie helped me pack up the bikes and load them into the back of the local bus, the night before our departure. The next morning at 5 am we broke camp in a total downpour and boarded the bus toward Chaiten, about four hours away. The bus dropped us off in the rain and in a small bus shelter (see slide show below) we reassembled the bikes and departed in the rain. 2 kilometers away was Parque Pumalin, Douglas Thompkins’ empire of American-do-good conservation in Chile. Here we had a campsite with an actual shelter! Three days of continuous rain kept us off the bikes, but 6 kilometers away were the Amarillo hot springs. Each day that we awoke to unending rain simply meant hitch-hiking to the hot springs! Not a bad way to wait out the rain. While waiting for the ferry, the rain returned with a vengeance. We were invited into the motor home of two families from Santiago. We spent two hours accompanied by hot chocolate and coffee and wonderful conversation, until the ferry finally arrived. In pouring rain, we had to decide whether or not to board. This was not an easy decision because the ferry trip is broken up by a 10-kilometer stretch of road. How would we cover the 10 kilometers? Either we ride it or we find a truck to transport us between one ferry and the other. In this moment of indecision a man approached me and said he would help me with the bikes. Clinched, let’s go. The ferry deck filled with several inches of water. In a complete downpour Sergio and I lifted the loaded bikes onto an already full pick up truck. He had excellent straps and hooks around the truck bed that allowed us to fully secure the bikes so that they would survive the 10 kilometers of nasty “ripio”. There I was in full rain gear with Sergio totally soaked down to his underwear. I thanked him for his kindness and he leaned in and said, “I am only doing what you would have done for me. That’s what is important in the world, Jon. We need to reach out and help others.” His family later confirmed that this is how their dad is; always picking up hitch hikers, helping others. The four-hour ferry ride was spent talking with Sergio, his wife, daughter and friends. It was such a joy, and I was very touched by the entire day, which began with a ride from the park guard, then the time spent with the families in the motor home, and finally, the generous help and company of Sergio and family on the ferry. The day left quite an impact on me and company of these families made this one of the most pleasurable days of the trip. We reached Hornopiren near midnight in the pouring rain, found lodging and a cash machine. The next day, however, a power outage knocked out the ATM. We need more cash and could not leave town until the machine was restored, which took three days. Each day I would stop by the tourist office to inquire about the machine. On day two a woman happened to be standing at the desk and she knew the wife of the bank manager. A phone call by her confirmed that I would have to wait until Monday. I commented about how much I enjoyed listening to her slang while she spoke on the phone. “Well, you must come by our business. We have a ‘cafe literario’ and I have a book I know you will enjoy.” I visited their cafe and met her husband. I brought Jenny and the girls there and it turned out that the couple ran sea kayak trips. The next day, we booked a two-day outing. A broken ATM and my annoying curiosity resulted in one of the highlights of our trip thus far. (More on the kayak outing with photos when we get back to Mendoza).